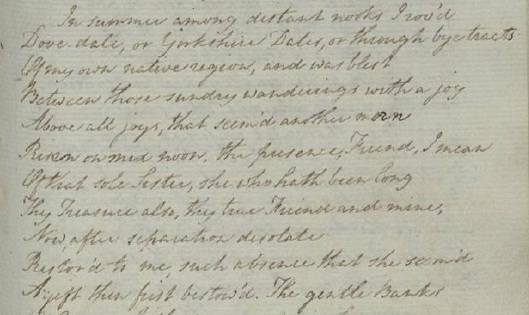 This description was written in a notebook used by Wordsworth during his years at Cambridge, which also contains translations of Virgil’s ‘Georgics’ and work that would feed into his poem ‘The Vale of Esthwaite’. The passage has several interesting features. Firstly, it is clear that Dovedale was a place that Wordsworth was keen to see and admire, as he states that he ‘rode over’ from Ashburn [sic]. As this trip was Wordsworth’s first known visit to the area, the fact that he acknowledges that one of the hills ‘about six years ago was cloathed with wood’ would suggest that he was familiar with either writing about or images of the area, which would have been responsible for him feeling the urge to ride over and see the scenes for himself. The passage from the 1805 text of The Prelude referring to Dovedale, taken from DCMS 53 at the Wordsworth Trust. This fair copy of the poem was made by Mary Wordsworth, the poet’s wife, and intended for his friend, Samuel Taylor Coleridge. This very brief, passing mention of Dovedale developed into a far more detailed account as William Wordsworth edited The Prelude throughout his lifetime. He doesn’t move quite so quickly on to the subject of his beloved sister, Dorothy, and places more emphasis on his exploratory quest through Derbyshire as a younger man. By the 1850 text, his early impressions of Dovedale, written in his Cambridge-era notebook, and his desire to visit such a beautiful location, are far more apparent, as the ‘hills of a form perfectly spiral’ find their way into the poem. The editing process that Wordsworth undertook can actually be seen in the manuscript editions of The Prelude that are owned by the Wordsworth Trust. In a copy of the 1805 text of the poem made by Dorothy Wordsworth, William makes extensive changes, and starts to include the lines that will find their way into his later depiction of Dovedale. 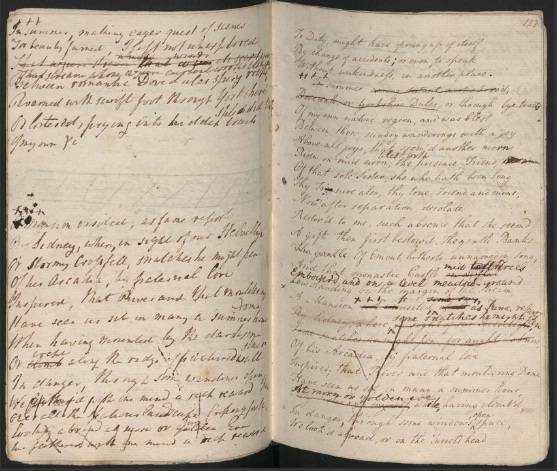 A full-page view of one of the working manuscripts of The Prelude (DCMS 52), heavily edited by William Wordsworth. The passage relating to Dovedale begins at the point of the crossing-out, four lines from the top of the page on the right. In this closer look at the mention of Dovedale, Wordsworth can be seen to strike through lines, and insert a more descriptive passage (on the left hand leaf), which would eventually lead to the 1850 version of the text. From information given in letters written by Dorothy Wordsworth, it is known that the Wordsworths were once again in Derbyshire, and paying a visit to Dovedale, in the summer of 1810. 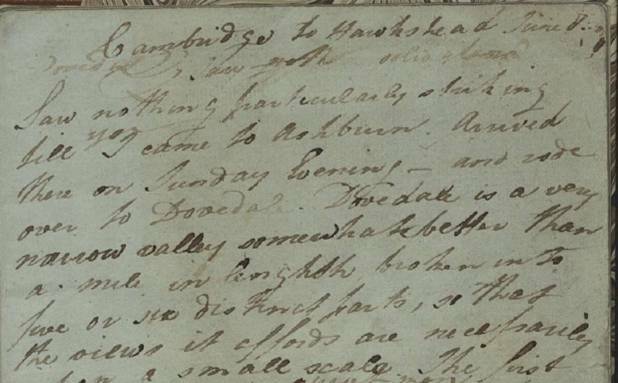 Writing to her friend Catherine Clarkson, wife of the abolitionist Thomas Clarkson, Dorothy says that she has had ‘a pleasant journey through Dovedale’, and, later, writes to another friend to tell her that she ‘had a delightful walk that evening to Dovedale’. This visit presented itself as a ‘delightful’ interlude during a very extensive trip; Dorothy would go on to travel through Cambridge and, eventually, on to Essex, to visit her brother Christopher and his family. By the time Dorothy Wordsworth was writing to her friends about Dovedale, William and his family had been living in the Vale of Grasmere for over a decade, a place he described as ‘The loveliest spot that man hath ever found…’. The Wordsworths’ affection for their own valley, surrounded by fells with the River Rothay flowing through, shows their preference for the type of landscape that they sought at Dovedale, which gave them such feelings of pleasure and delight. A big thank you to Helena Sinclair for researching and writing this post and for the Wordsworth Trust for allowing us to use the images of their manuscripts. If you are interested in another literary take on Dovedale then read Dovedale: A Neutral but Interesting Conversational Gambit on the AustenOnly blog.